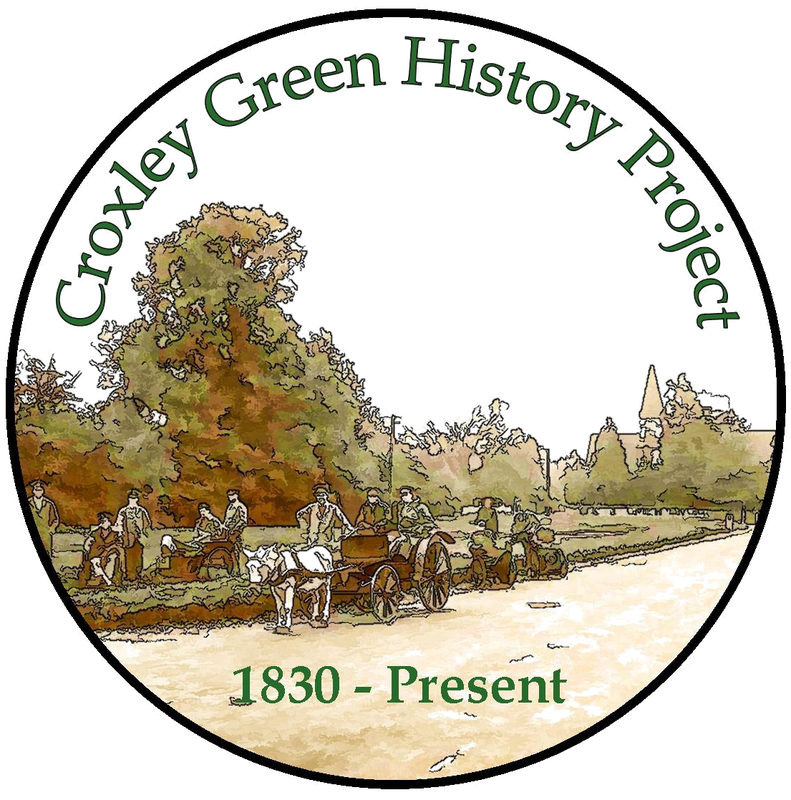 Lieutenant Colonel Sir Guy Spencer Althrop - Croxley Greens only Baronet ! 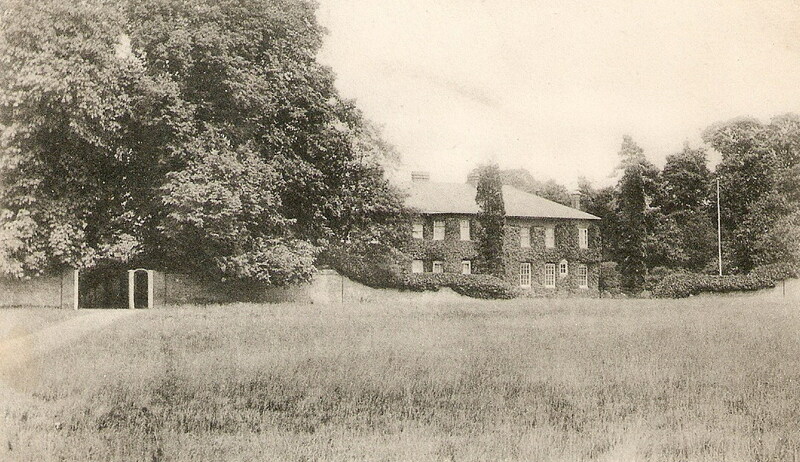 Sir Guy Spencer Calthrop lived for a short while in Croxley House, The Green. He was born in1870 to parents Everard Calthrop (1820-1890) and Mary Ann Edmonds (1835-1890) in Uppingham, Rutland. His father was a landowner/farmer of 600 acres, employing sixteen men, two girls and four boys. The 1871 Census reveals his parents had seven sons and one daughter. Guy was the youngest son. The children were Everard Richard, Frederick Cecil, Harry Clyde, Ernest Noel Everard, Lionel Claude Everard, Hugh Victor Everard, Guy Spencer and daughter Marion Elizabeth Mabel. The Census shows that the servants included Alice E. Weavers, head nurse; Emma Nichols, cook; Mary A. Lewin, housemaid; Jane Lewin, under nurse and William Bell, groom. Sir Guy joined the London and North Western Railway (L.&N.W.R.) when he was sixteen as a cadet. 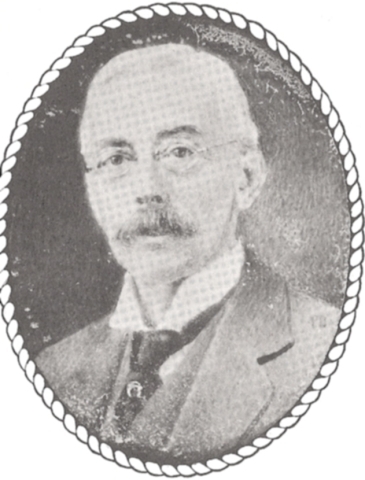 His elder brother, Everard Calthrop, was a railway engineer and is thought to have influenced Guy in his choice of career. 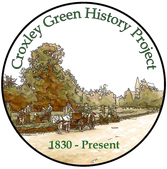 In 1892, at the age of twenty-two, he was appointed outdoor assistant to the Superintendent of the railway line at Euston, progressing to the personal assistant to Sir Frederick Harrison in 1901. Also in 1901, Sir Guy married Gertrude Margaret Morten. She lived with her family in Denham, Buckinghamshire. He was thirty-one years old and Gertrude twenty-two years old. The following year, in 1902, Sir Guy left the L.&N.W.R. to take up a position as General Superintendent of the Caledonian Railway and was promoted to General Manager in 1908. In 1910 Sir Guy accepted a position as the General Manager of the Buenos Aires and Pacific Railway, spending three years in this post before returning to Britain in 1913 to rejoin the L.&N.W.R. 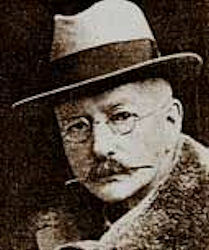 Following the death of the company's General Manager, Sir Frank Ree, in 1914, Sir Guy was chosen to succeed him. During the First World War, Sir Guy was seconded by the Government, and was appointed Controller of the Coal Mines. Coal was a major commodity for both home and commercial use. In many mining communities the male family members worked as a team extracting coal from the mines. With the war in progress in Europe, and many hundreds of miners wishing to join up, Sir Guy’s job became very demanding. At a British Miners' Federation Conference at Southport, Sir Guy made an appeal, saying that the recruitment of so many miners for Army services had created a deficiency of twenty-seven million tons of coal. Severe rationing became necessary in domestic and industry requirements. Shipments to neutral countries as well as those in the conflict were well below the agreed quotas. He announced that no more miners should be released from the coal industry. 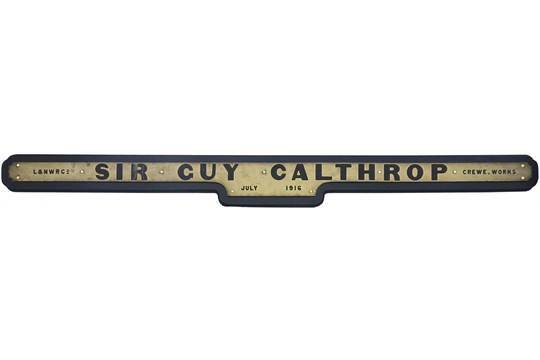 In 1916 a Claughton Class 4-cylinder express passenger 4-6-0 steam locomotive was built at Crewe and given a name plate 'Sir Guy Calthrop'. At the end of the war in 1918 in recognition of Sir Guy Calthrop's efforts he was created a Baronet by King George V. Newly created Baronets are awarded the title 'Sir' Early the following year Sir Guy was diagnosed with influenza and unfortunately pnemonia followed very quickly. He died unexpectedly on 23rd February 1919, aged forty-eight. He was buried in the Rickmansworth cemetery in Chorleywood Road. His title terminated upon his death. It is not my custom to preach a sermon to you at the Morning Service on the first Sunday of the month, as it is our Choral Eucharist Sunday; but on an occasion such as this I ask you to allow me the privilage of paying my humble tribute, in a very few words, to the memory of one, whom, amid an extra-ordinary manifestation of love, honour and respect, we laid to rest on Thursday last. All mourn today the loss of a great man and some in the church that of a clear and valued friend. We believe that when our work in this world is over, God calls us to Himself. While holding fast to the belief, it is hard for us to understand why, in the mind of God, the work of Guy Calthrop is this life should be over. We felt that great as his work has been in the past, still greater work lay before him in the future: a work that was so near to his heart and in which he was so eminently capable of taking his share, that of helping forward peace in industrial strife. We felt there was a great place for him in the nation of the future, but God in His inscrutable wisdom knows best, and after a brief illness called him to Himself, in the prime of his life, on Sunday afternoon last. Of his great work for the country during and after the war I need say but little. We all know how bravely he faced a thorny and difficult problem, a problem to which no thanks were attached, but instead abundant criticism, but nevertheless one which he solved with such conspicuous success; a problem which not only needed a clear head and remarkable ability, but which also involved the expenditure of great personal energy and strength. When last year the King in his Birthday Honours list created him a Baronet the nation felt that the honour was richly deserved. Of so much of his work but little has been heard. His arrangements for railway transport; his visits to the mining districts; his earnest and vigorous exhortations to the miners to aid in production to the utmost of their capacity, and in addition to this, his efforts to do all in his power to allay industrial strife. By special request, the hymn, “ Fight the good Fight” was chosen for the service on Thursday last. Sung as it was by a great congregation, largely consisting of men, it sounded like a shout of triumph for the Victor who had won his Crown. All of us who were privileged to be there, old, middle-aged, and young, must have felt that hymn to be an inspiration to us to carry on and do our duty, even as he had done his. Scarcely could a hymn have been more aptly chosen, for indeed he fought the Good Fight to the very end; he ran the Straight Race through God's Good Grace. It is for his country that Guy Calthrop died, the country of which he was so whole-hearted a patriot, and for that country he has given his life as surely as any soldier who has died in the trenches. The King's message of grief at “the sudden and irreparable loss” but expresses the feeling of the whole country. Uprightness, straightforwardness, and love of duty, was the motto of his life. These virtues, combined with a delightful and charming personality, endeared him to all with whom he came in contact. We, of the Parish in which he lived, shall sadly miss him. Whenever he was here, his place in church on Sunday morning was regularly filled, and with that energy which characterised all that he did he took his full part in the service. He walked with God in his life, and he has gone to that closer walk with God in the Great Hereafter.